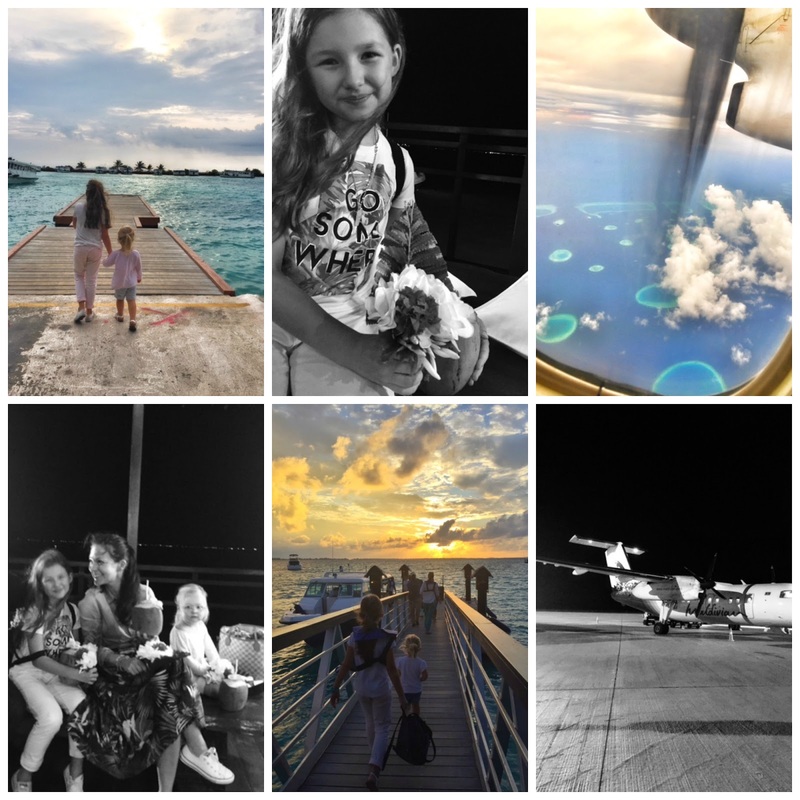 Destination Maldives - our spring break holiday turned to be a family holiday of a life time. 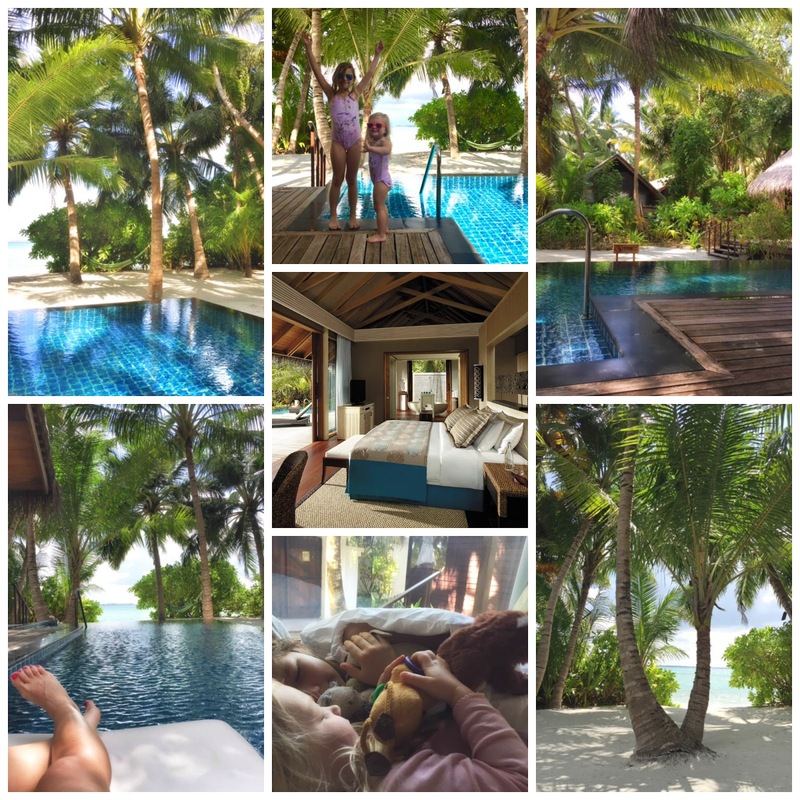 Here's the details on the gorgeous resort, how to get there, what to do and maybe inspire you and your family to visit beautiful Maldives. Morning flight from Dubai with Emirates Airline to Malé, only 4 hours flight. Relatively easy, we had some lunch and watched a movie, girls were happy and excited to go on an adventure. When you are used to 6 or 7 hours to Europe, that’s a breeze, well kinda! Shangri-la’s Villingili Resort & Spa Maldives, is located in Gan (Addu Atoll), it’s the southernmost island of the Maldives, pass the equator. The hotel will arrange for you a domestic flight from Malé to Gan International Airport. It’s not a cheap flight, about USD405 for adults and USD325 for children plus tax. We had to wait one hour in Malé Airport before boarding our flight to Gan with Maldivian Air. It was well organized, a staff from Shangri-la Villingili Resort escorted us to Moonimaa Lounge, where we had some snacks and complimentary wifi. The staff did all the checking-in for us. The small propeller plan is a bit daunting at first but it’s fine and with the excitement of reaching the island you get at ease. When passing the equator, the flight attendant will give you, your personalize certificate “You passed the Equator”. I expected a 1h flight, turned to be more like 1h30. Both girls slept on the flight, recharging their “batteries” for what to come. Arriving in Gan tiny airport was smooth and within 20min we were on the speed boat to Shangri-la’s Villingili. The boat transfer is just 10 minutes, we were all of a mix of emotions tired, excited and full anticipation. It’s quite a journey, specially with kids, but I can’t complain all went well and relatively smoothly. So yes, I would say after domestic flight and speedboat transfers to get to there, it was all worth the effort. It really felt like an adventure. Arriving at the resort was like falling into paradise, being welcomed by smiling staff, beautiful flowers arrangements, cold towels and refreshing fresh coconuts. After being escorted to our villa by buggy, by our personal villa host we did the check-in process in our room while the girls were exploring our beautiful Deluxe Pool Villa. 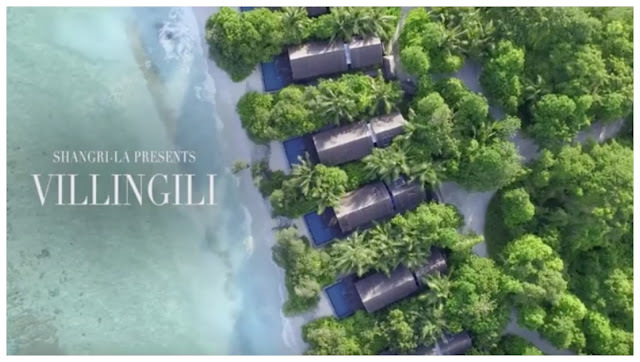 Shangri-la’s Villingili Resort & Spa Maldives is one of the biggest in Maldives. It’s about 3km long, which give you plenty to explore by walking, in a buggy or on bicycles which we absolutely loved! The resort feel eco conscious if I can say, it has retain lots of its original vegetation and wild life. There is three natural lagoons and jungle with trails to explore and frogs, lizards, bugs, birds and flying foxes (fruit bats), making the island fascinating for children. I regret we did not do the Ecological Tour, sure it would have been very interesting as family activity. Love that they have a rule of planting 2 coconut trees for each one they cut down. The island counts over 17 000 coconut trees, making the island so green and lush. To show their commitment to eco-conservatism there is a Chef’s Garden, with locally produced spices, herbs and vegetables for the restaurants to use. At the centre of the resort you will find The Village, small little pathways to the shop (souvenirs and beach gear), dive centre, eco centre, health club, medical centre, tennis courts, kids club, the reception and M lounge for sundowners (happy hours at sunset). Also close by, is the main restaurant Javvu for breakfast facing the sea and along the way the swimming pool resort with the water sport centre. The resort is big enough to never feel busy while you still get to meet other guests if you are looking to socialize or kids to make friends. 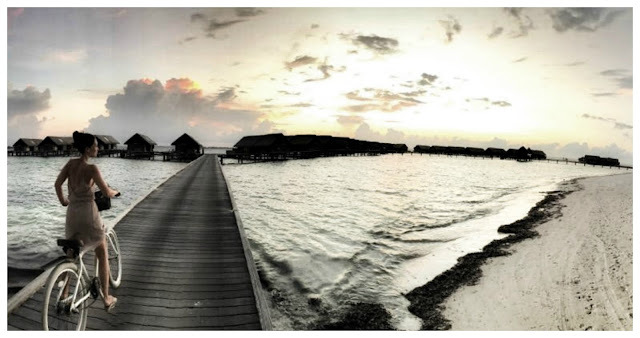 The jetties take you to the Water Villas (see here). They must be a real treat, but with our two years old, we decided to stay in a land villa. Our Deluxe Pool Villa (see here) was absolutely gorgeous, well situated quite central not far from the village. Composed of two separates areas, first the bedroom with a massive bathroom and outdoor shower on one side and a lounge area on the other side. Both bungalows are facing the swimming pool with a nice deck and outdoor furniture. The pool is lovely and the sea is step away from the garden. It might not be the best side of the beach for swimming but just seeing the sea when you wake up or for a quick morning walk, is truly blissful. Each guest is provided with a bicycle parked in front of the villa, perfect for exploring the island, getting places and as a family activity. We absolutely LOVE it. They equipped my husband bike with a child seat so we could have Josefin tagging along with us all around the island. Family guests are appointed a personal villa host to help you with bookings, activities, reservations and all your questions. You get a mobile phone to personally reach him if needed. Our host visited us everyday to make sure all was well and offered suggestions about activities and restaurant booking. I think it's part of a great guest service. We spent most of our time at the beach or at the pool or exploring the island on bicycle. Hubby took our daughter Luella for a round of golf just before sunset, truly beautiful setting and quite a special experience. Shangri-la’s Villingili Resort use to have the first 9-hole golf course in the Maldives until recently. We enjoyed some water sport as well, took a tour on Jetskis as a family and enjoyed it so much we did it again the next day. There is a Kid Club, “ The Cool Zone” and an outdoor playground that we visited once, it’s small and a bit dark but convenient. We did not experience any of the daily kids activity, the days were already filled with so much family fun. 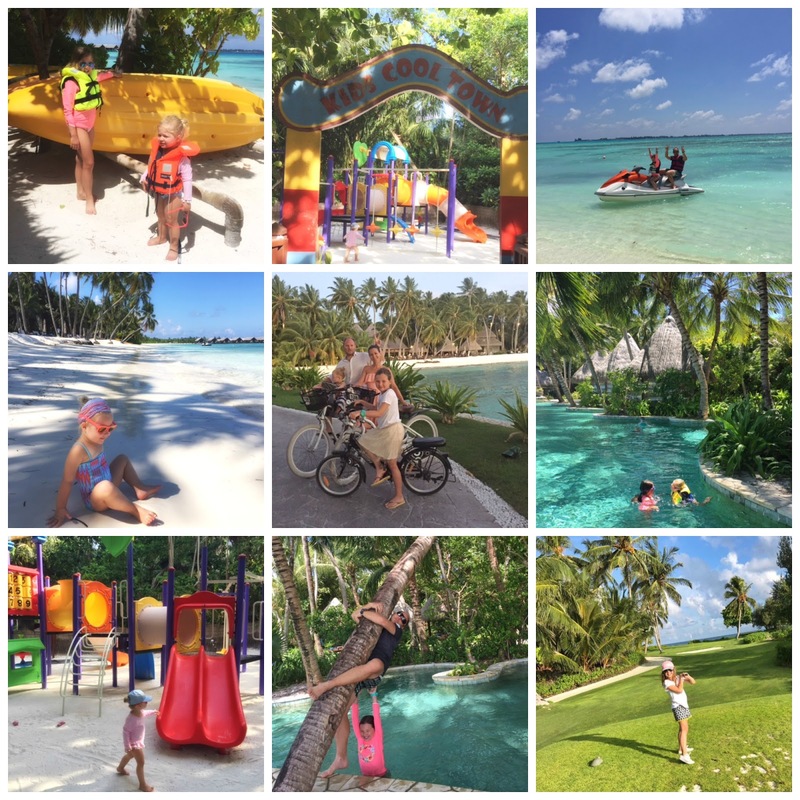 If your little ones need some adventure or entertainment there is some educational activities and lots of land and beach-based activities to ensure a fun-filled vacation for the children. The program included Jungle Discovery, Crab Hunting & Racing, Nature Arts & Crafts, Island Fitness, Tropical Safari to identify the Big 5 and Small 5 inhabitants on land and underwater. An important part of a vacation is definitely the food. The Shangri-la’s Villingili Resort restaurants and food quality did not disappoint. 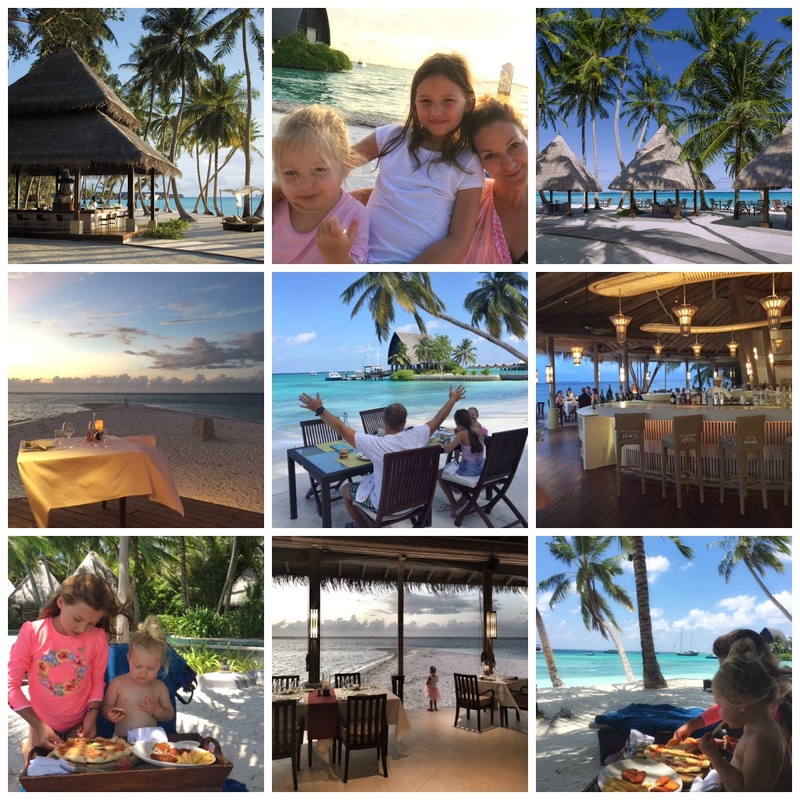 We enjoyed our daily breakfast at the main restaurant, Javvu meaning “atmosphere” in local Dhivehi language facing the turquoise water right on the beach where the girls could run around while mama and papa enjoyed a second cup of coffee after a very delish meal. It’s a large buffet but not overwhelming with eggs, noodles and pancakes station. There is a small kids buffet table as well. It’s all very friendly and tasty, great way to start the day. There is two other restaurants, that were both very nice, set by the sea and that I would definitely recommends, Dr Ali’s serves South East Asian, Middle Eastern, and Indian dishes.We had a curry degustation menu - lovely! The second option is Fashala, meaning “the edge”, a more formal option with amazing fine dining. Local produce from the surrounding waters and neighbouring farms are at the centre of the gastronomic offerings. The gorgeous set up on the north tip of the island is perfect for a romantic diner but like us, a family with children could enjoy the special treat as well. For children there is a good kids menu across all the restaurants. As a family resort, Shangri-La's offers a Family Plan which provides children under 12 years old free accommodation staying in the same room with their parents, up to a maximum of 2 children per room. It’s also inclusive of food. Yes kids eat for free! Everyday, our girls could enjoy their meals from the Kids Menu free of charge. Must read all the details but it workout great for us. So yes, we definitely would recommends Shangri-la’s Villingili as a beautiful family friendly resort. - Loved that the island is big enough to be explored on bicycle with a green a lush vegetation and enough wild life to get the kids excited about nature. - Convenience of providing bicycles for the whole family to enjoy together and get to places. - Large villa to accommodate our family in gorgeous setting. - Service was friendly and efficient. The personal villa host is a good example of the quality guest service. - We never complained about the food and truly enjoyed every dinner experience. We were on half board plan, which i think is a great option on vacation. Late breakfast and family diner at night are covered and you can just take a snack by the pool at lunch if needed. - Shangri-la takes care of it's little guests. The Family Plan with complimentary accommodation and food is a great program. It's a good factor when considering your holiday budget. The Maldives is gorgeous as we have all seen beautiful photos of turquoise water and white sandy beach. I was wondering if the domestic flight is worth the effort (extra time to your travel journey) and money (a considerable expense as a family of four ). After reflection, yes it probably is, as we love the beautiful island so much. 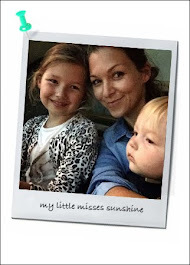 While travelling with children you definitely need to take it in consideration. We were not so lucky with our snorkelling experience. The weather was lovely but the constant wind we experienced during our stay made the water little murky for visibility. To snorkel you need to get to one of the jetty and snorkel toward the reef, making sure to go the right direction. It's a bit far and not that convenient, make sure to ask at the dive centre to direct you properly. Compare to our previous Maldives experience years ago where we could snorkel right from the shore in front of our villa up to the reef and see the most amazing marine life, I was a bit disappointed. 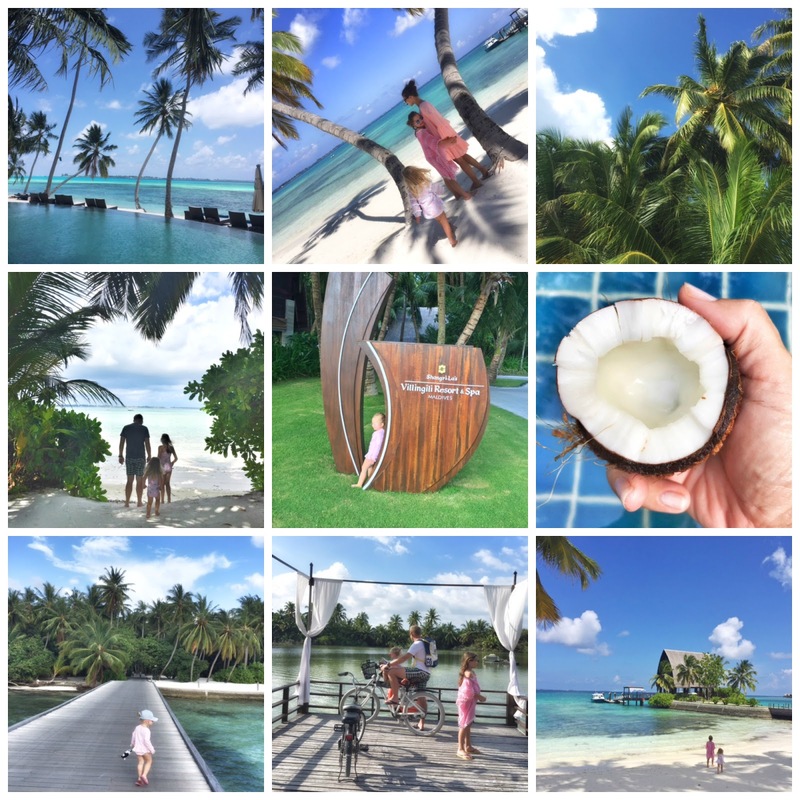 Our 5 days vacation in Shangri-la’s Villingili Resort & Spa Maldives will be something we’ll never forget. While enjoying our last drink at the M bar before heading onto the boat taking us to Gan airport, we as a family could reflect on the experience and all the wonderful memories to cherish for years. Thank you Shangri-la Villingili for your hospitality.